When sophisticated heating and cooling consumers want to improve their home health, energy efficiency and comfort, they turn to innovative braemar products and systems. Browse through our wide selection of residential products, or find a dealer and expert to help you customise the perfect braemar solution. Unlike refrigerated cooling which requires you to keep doors and windows closed to maintain a cooler temperature, evaporative cooling requires you to leave your doors and windows open. This is great news if you have children who are constantly running in and out of the house! Ducted central heating offers heating flexibility through zoning. Zoning enables you to divide your home into sections so living areas can be heated during the day and sleeping areas at night, or whatever suits you. The braemar ICE Series add-on air conditioner gives you total climate control in your home, year round. This series incorporates a braemar air conditioning unit as well as a braemar ducted heater to give you both heating and cooling through the same ducts. 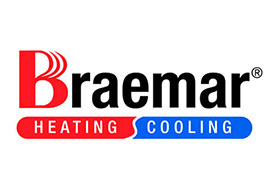 braemar Ducted Reverse Cycle (DRC) refrigerative air conditioning gives you the total climate comfort with convenience and flexibility to cool and heat your home just how you like it, all year round. The braemar Hi-Wall Inverter Split System is more responsive and smoother running than standard fixed speed air-conditioners. That is why the braemar Hi-Wall Inverter saves money in running costs by lowering energy consumption. The braemar DualComfort whole of home gas ducted heating and refrigerative cooling solution allows you to create that perfect feeling of comfort throughout your home. This ducted air conditioning solution provides refreshing, refrigerated cooling and gentle, comfy gas heating. Ambient Air Pty Ltd © 2016. Website by HappyWeb Melbourne.